Delta Upsilon is the exclusive owner of its trademarks. In order to safeguard the appropriate use of our federally registered trademarks and to guarantee quality products, Delta Upsilon is one of many Greek organizations that have entered into a trademark licensing agreement with Affinity Marketing Consultants (AMC). All commercial use of Delta Upsilon's trademarks must be administered through a license agreement with Delta Upsilon. 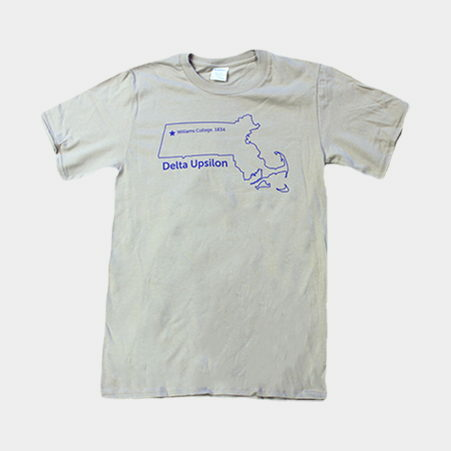 To shop for official Delta Upsilon products, visit our entire list of licensed vendors here. Here you can access a national network of vendors and get multiple quotes for your custom order needs. We've contracted with some fantastic companies to bring you some official Fraternity merchandise. Place your order today! * Please note that orders placed through Delta Upsilon International Headquarters after Dec. 19, 2018 will not be shipped until the new year. IHQ will be closed for the holidays. Long-sleeved, light blue cotton T-shirt. Design features the Delta Upsilon letters on the front chest. Back features the Fraternity flag, "Delta Upsilon" and "Est. 1834." Short-sleeved, gray cotton T-shirt. Design features the outline of the state of Massachusetts and the location of Williams College, DU's founding site. This limited edition sock is a cotton and nylon blend and is made exclusively for Delta Upsilon by Sock101.com. LOOKING FOR MORE GREAT DU MERCHANDISE? Our partners at Affinity Consultants have made it easy for you to find merchandise and vendors near you! 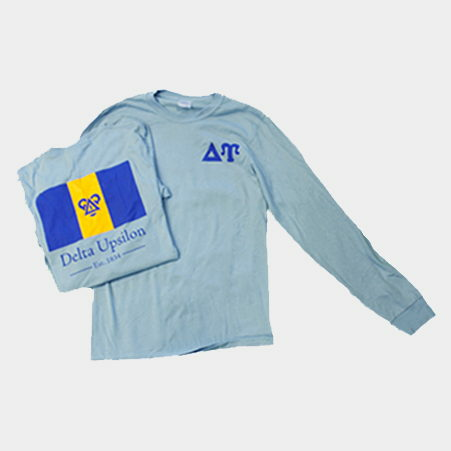 By using Delta Upsilon's FindGreek page, you can easily shop for gear or find a vendor to help you create custom designs. The GEICO auto insurance program offers Delta Upsilon members quality car coverage with award-winning 24-hour sales, policy, and claims service. In addition to receiving GEICO's already low rates, as a Delta Upsilon member you may also qualify for a member discount, available in most states. For more information visit GEICO or call 1-800-368-2734 FREE for a free, no-obligation rate quote. Since 1818, Brooks Brothers has set the standard for modern American style. Throughout the years, Brooks Brothers has become an International icon revered for the quality and classic elegance of its services and merchandise for men, women and boys. Incentive - 15% Discount on regular and everyday value priced merchandise at Brooks Brothers U.S. and Canada stores, by phone or online. How to Enroll - Enroll online. Enter the Organization ID# 32701, then enter the Enrollment Pin Code# 78956. Or enroll by telephone by calling Corporate Incentive Services toll-free at 1-866-515-4747, Monday-Friday, 9 a.m. - 5 p.m. EDT. Please have DU’s Organization ID# and Pin Code# available. Your Brooks Brothers Corporate Membership benefit is valid at Brooks Brothers U.S. and Canada stores, by phone or online at BrooksBrothers.com. Savings cannot be combined with any other offer, discount or promotion or for purchases of the Gift Card. Receive rental discounts up to 35%. To receive the discount, present the CDP# 2009766 when making a reservation. Other benefits include: unlimited miles, free Hertz Gold Plus Rewards Membership, 500 Bonus Rewards Points (enough for a free weekend rental day), and periodic Member-only promotions. Call Hertz at 1-800-654-3131 and provide them with the code above. Receive a 5-10% rental discount. To receive the discount, please present the Contract # 5453053 when making a reservation.